Ria Loves Pawlish: New China Glaze App For iPhone, iPad, and iPod touch! New China Glaze App For iPhone, iPad, and iPod touch! 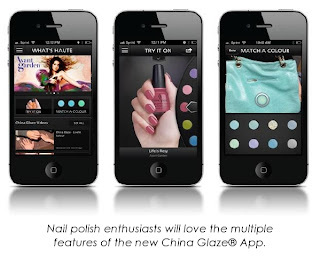 i'm super excited to share China Glaze's new app with you all! i'm so jealous that it's only for iPhone, iPad, and iPod touch, since i have an Android phone. probably my favorite feature has to be 'Match A Color', which allows you to take a picture of anything and match it up with a China Glaze polish... that is SO awesome. best of all, it's a free download :) crossing my fingers the app comes to the Android platform, soon! Los Angeles (March 19, 2013) – Swatch it, watch it, match it! China Glaze® brings the world of nail color to life with the launch of the NEW China Glaze® App for iPhone®, iPad® and iPod touch®. The free app offers multiple features perfect for every nail polish enthusiast, and utilizes the latest cutting edge technology to transport users into China Glaze®’s colorful universe. The new China Glaze® App offers a first of its kind “Match A Color” feature, where users can truly “Live In Colour” from the palm of their hands. “Match A Color” was created with the latest technology to allow users to take a photo of anything they desire with their iPhone®, iPad ® or iPod® touch and then browse through multiple options, from exact shade matches to related textures from the brand’s expansive treasury of over 300 colors. This must-have feature allows nail polish enthusiasts to find polish-spiration anywhere at anytime. That hot pink bag you were eyeing? Yep, there’s a China Glaze® polish for that. In “Try It On,” users will find themselves in a China Glaze® fitting room, where they can select shades from the China Glaze® closet to try on customizable virtual nails. Users can determine which shade looks best on them by adjusting the nail length and skin tone to match their own hand, and save desired shades to the device’s camera roll for easy reference. Sharing is caring, and in the colorful world of China Glaze®, “What’s Haute” is the place to see what’s hot. Connect here with the brand to see real-time updates of new collections, nail trends and “how-to” video feeds from the official China Glaze® YouTube Channel. All features on the China Glaze® App allows users to share their favorite shades with their social media networks including Facebook, Twitter, Pinterest and Instagram. Did you say your friend really liked the shade Re-Fresh Mint you were wearing yesterday? Send the color straight to her Facebook page, or @her on Instagram. Nail professionals, the China Glaze® app has something for you, as well. Salons and nail pros can register for product updates and to be listed in the Salon Locator feature, currently in development for future updates. Also in the works are features to expand the China Glaze® app into a true community, including Discussion Boards, Wish Lists and more. The China Glaze® App is available for free download from the App Store on iPhone®, iPad® or iPod® touch or at www.AppStore.com. China Glaze® is free of DBP, toluene, and added formaldehyde. China Glaze® nail lacquers are available through salons and professional beauty supply stores nationwide. For more information, visit www.chinaglaze.com or follow China Glaze® on Facebook (facebook.com/chinaglazeofficial), Twitter (@chinaglaze), Instagram (@chinaglazeofficial) and Pinterest (@chinaglaze).